Ngong Ping Cable Car - the gateway to start your Lantau adventure in Hong Kong! Ngong Ping Cable Car connects downtown Tung Chung and Ngong Ping on Lantau Island. 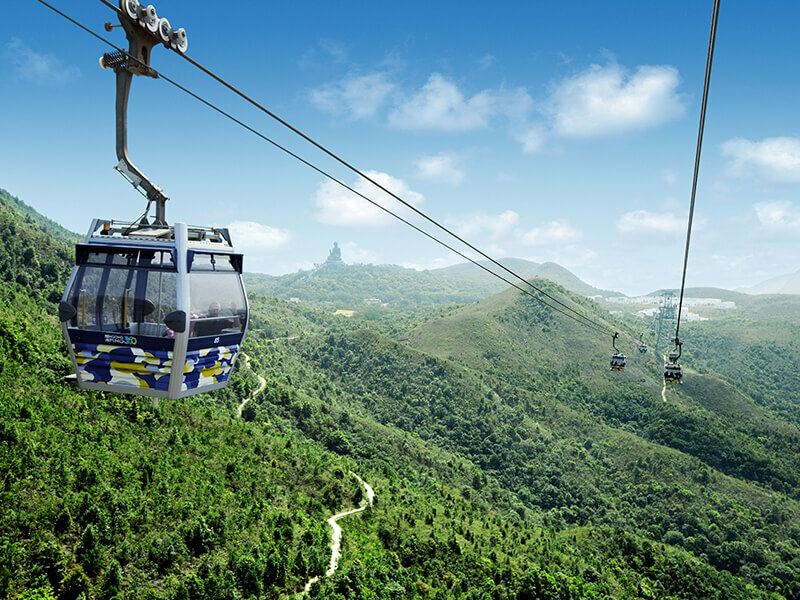 Adopting a safe and reliable bi-cable ropeway, the cable car is first-of-its-kind in Hong Kong. The journey begins from Tung Chung, crossing Tung Chung Bay to reach the angle station on Airport Island and turning 60 degrees towards North Lantau. You will be greeted with the vistas of the distant and vast South China Sea and the rolling greens of North Lantau Country Park. At the comfort of the cabin, enjoy the breathtaking panorama of the Hong Kong International Airport, verdant, mountainous terrain of Lantau Island, the Big Buddha and the 360-degree view of Ngong Ping Plateau. 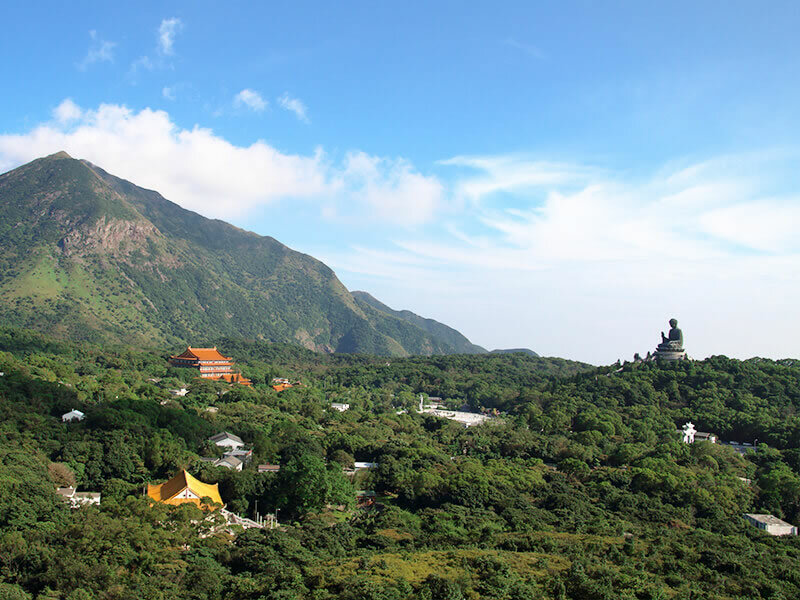 Alight from the cable car cabin and you will arrive at Ngong Ping Village – the best starting point for your Hong Kong visit to “must-see” attractions such as the Big Buddha, Po Lin Monastery, Tai O fishing village, etc. The Ngong Ping 360 cable car ride is famed as one of the world’s most amazing cable car experiences. Get on our standard cabin for a perfect start for your Hong Kong day tour. 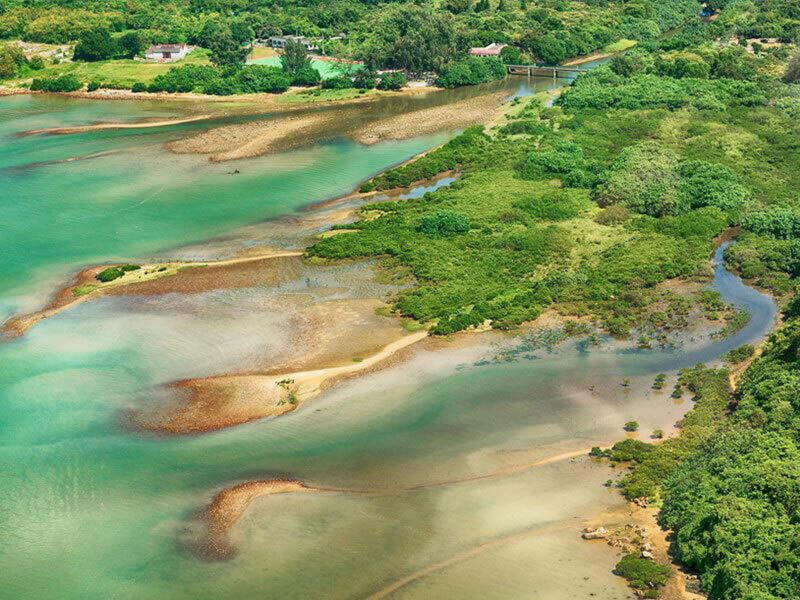 Observe Lantau’s nature and native ecology, and experience the other side of Hong Kong. The glass bottom feasts your eyes with a thrilling view of the boundless sea and the rolling grassland slopes, right underneath your feet. Enjoy the novel, uncluttered bird’s eye view. A private space up in the air. You will also enjoy queue-free ticketing service and priority boarding. Choose your round trip cable car ride from standard or crystal cabin and enjoy complimentary admission to “Walking with Buddha”. 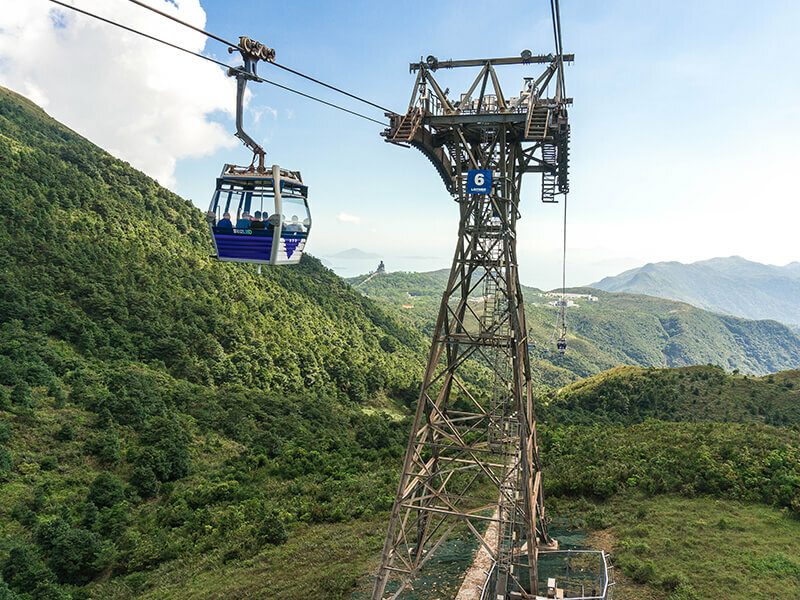 As soon as your cabin leaves the Tung Chung Cable Car Terminal, you will be treated with the aerial view of the well-developed new town called Tung Chung which is part of the new development of Lantau North. Located in northern Lantau and formerly known as “Tung Sai Chung”, Tung Chung boasts a history of over a thousand years. It is one of the important passages to Hong Kong because of its proximity to the Hong Kong International Airport. 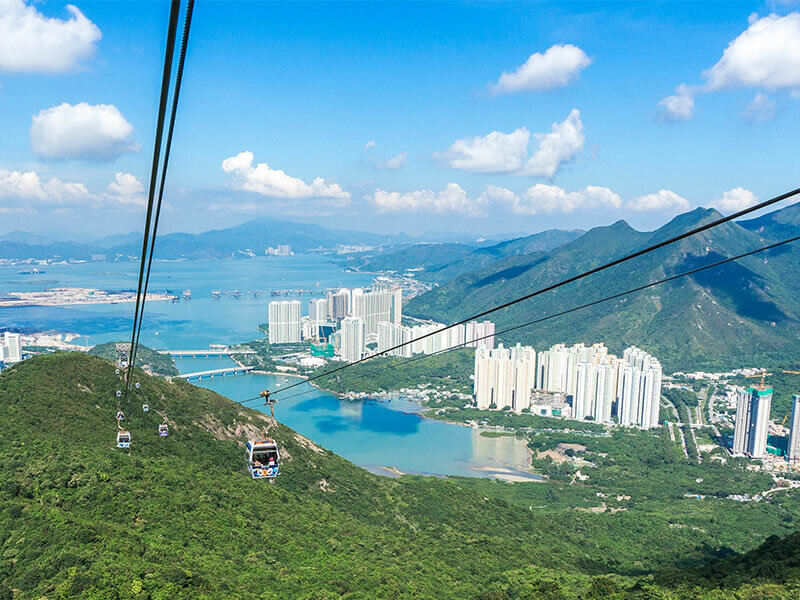 Looking down from your cable car, you will next see Tung Chung Bay, an amazing natural habitat for wildlife and a popular destination for fishing and clam digging. The bay is also home to the Shan Tau wetlands, which is listed as a Site of Special Scientific Interest. The unique combination of wetland with seagrass is rarely seen in Hong Kong. From the cable car cabin, you can see the entire Hong Kong International Airport from mid-air. You may even be “flying” with passing-by aircrafts! 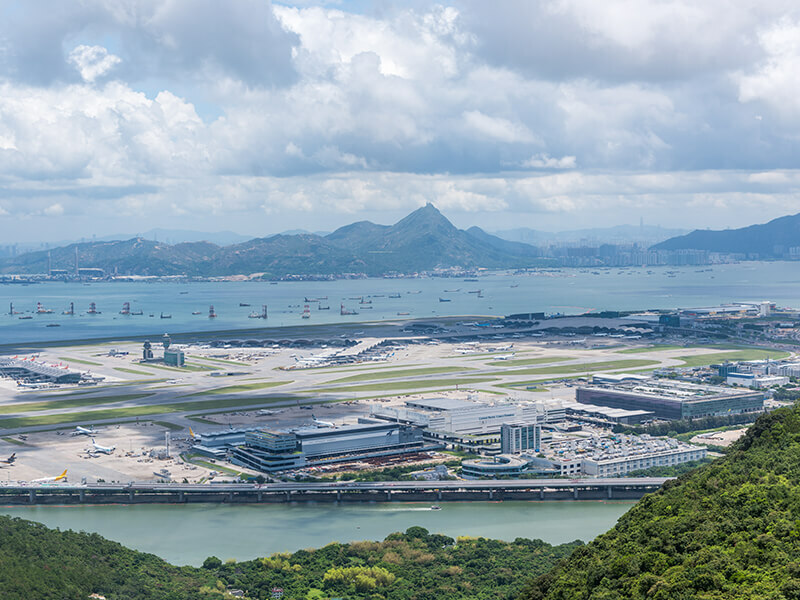 Connecting Hong Kong with over 220 destinations, the airport offers approximately 1,100 flights daily. It is one of the largest airports in the world in terms of passenger volume, and the proud winner of the world’s best airport award more than 60 times. 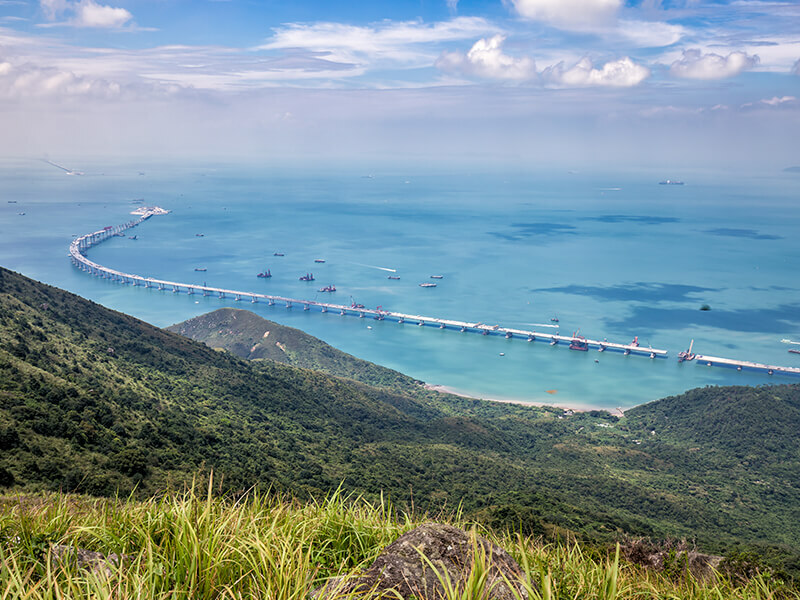 The distant view of the fifty-kilometer long Hong Kong-Zhuhai-Macau Bridge also comes with the stunning backdrop of the vast ocean and the blue sky. Connecting Lantau of Hong Kong, Macau Peninsula and Zhuhai in Guangdong province, the bridge comprises artificial islands and an undersea tunnel. Upon completion, it will become the world’s longest six-lane undersea tunnel. The dense vegetation in front of your eyes is the Lantau North Country Park, Hong Kong’s largest country park. Established in 1978, the park’s 22 square kilometers cover quite many popular hiking locations, such as Sunset Peak, Yi Tung Shan, Lin Fa Shan, the northern slope of Lantau Peak, as well as Nei Lak Shan and north of Ngong Ping. The area is packed with hikers during weekends. Nei Lak Shan is Hong Kong’s sixth tallest peak. At 751 metres above sea level, you can see the full view of the South China Sea and the Hong Kong-Zhuhai-Macau bridge in the distance. When the sky is clear, you can even see Macau from here. 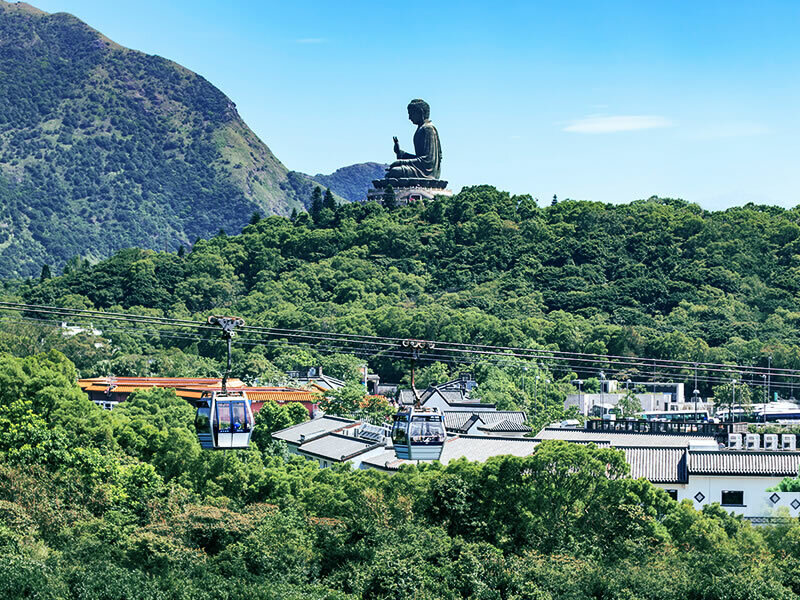 Before your cable car reaches Ngong Ping, you will catch a glimpse of the world-famous Big Buddha surrounded by verdant, mountainous terrain. At 34 metres tall and weighing 250 tones, it is the world’s second largest outdoor bronze Buddha statue. Say hello to Ngong Ping Village as the cable car is about to complete its journey. Sitting on a 1.5 hectares site, Ngong Ping Village is designed and landscaped to reflect the cultural and spiritual integrity of the Ngong Ping area. It is highly popular amongst local and overseas tourists. You can select to see the live webcast of Airport Bay Direction and Tung Chung Bay Direction. Embark on your Tai O day trip from Ngong Ping 360! Exclusive visit to Tai O stilt house with a professionally guided experience!